On February 1, 2008, Netscape Navigator will be resting in peace completely, as detailed in “Days dwindle for Netscape Web browser” by the Associated Press. 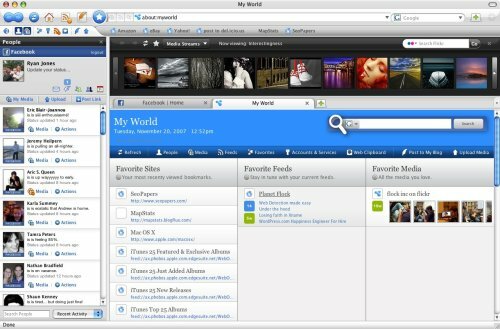 After the 13-year run of Netscape, within it is its struggle against the browser giant Internet Explorer and the rest of the browsing new-comers, Time Warner Inc.’s America Online or AOL, Netscape’s current owner and keeper, decided to halt further developments of the browser last December 28, 2007. Seeing what is more fitting, the company will instead focus on flourishing more in the advertising business, and the ongoing support for Netscape will be canceled next month. Netscape fans and web developers will still be able to download and use the Navigator (probably for keepsake or for platform stability of created web pages, respectively) as remnant of the “dying” browser in its virtual household. The administrators recommend downloading and using Firefox in its place, as it is the more popular open source cousin of Netscape. Netscape director Tom Drapeau posted in his blog last December 28, 2007 that there had been efforts on reviving Netscape Navigator to continue its heritage as the first widely-used web browser, but such efforts weren’t successful in gaining a better share from the pool of web browser’s market. A central figure during the Netscape’s glorious birth in 1994 was Marc Andreessen, cofounder of Netscape Communications Corporation, who developed the first commercial web browser ever: Netscape Navigator, which also stood as its flagship software. It was financed by the recently-departed founder of Silicon Graphics Jim Clark, seeing that it has great commercial potential. However, Microsoft noticed the booming success of Netscape, prompting it to release within its flagship Windows operating system its Internet Explorer for free. Suffering from a great loss as users started migrating to Internet Explorer, Netscape eyed the open-source license as a resort for regaining its audience. However, the product named Netscape 5 never saw release because it was deemed to suffer from poor quality. With a large contribution from the open-source community, the project saw light, transforming into Mozilla and was released as Mozilla 1.0 on June 5, 2002. And with the same code base, standalone applications Firefox and Thunderbird were born, although they suffered from a long-drawn-out development. With Internet Explorer leading the browser race, Netscape was sold for $10 billion to AOL, which released Netscape 6 based from the open-source Mozilla browser. That alone gave enough reason for people to abandon Netscape and migrate to Internet Explorer. Sadly, Netscape’s popularity in the market dropped from 19.25 per cent in the first quarter of 2000 to a depressing 0.06 per cent in 2007’s last quarter, according to the tally of Wikipidia from the stats of The Counter. The decreasing popularity and market share Netscape receives are what prompted its closing next month. Seems like we wouldn’t be seeing much from the pioneer of web browser technology anymore. Version 1.0 of the much anticipated Flock browser was finally released earlier this month following more than two years of development. The release was met with much fanfare, but despite the amount of time and energy put into Flock, at this point it remains little more than a piece of eye candy. Flock is a very good browser, being that it is basically Firefox in a shinier skin. But it falls somewhat short in the other areas of functionality it boasts. Flock’s blog editor, for instance, is woefully less powerful than the alternative browser-based tool Scribefire, and light years behind corresponding desktop tools like MarsEdit, Ecto and the newly-popular Windows Live Writer. Similarly, Flock’s built-in RSS feed reader is polished and easy to use, but currently can’t hold a candle to the likes of NetNewswire, FeedDemon and Newsfire. The bits of Flock that shine the brightest are the Facebook sidebar and the browser’s integration with online photo storing sites Flickr and Photobucket. However, despite the Facebook sidebar’s impressive functionality, it still pales somewhat in comparison to simply leaving Facebook open in one of your browser tabs. And while the photo uploading and sharing tools are likewise well implemented, the millions who turn to Kodak, Google and various smaller providers for their online photo storing needs have been left out in the cold. Some will argue that while Flock may not be the best of breed at any of the individual functions it performs, it does provide the benefit of being able to do all those things from within a single application. But at a time when many new computers are offered with at least 1GB of RAM, and additional memory can be purchased dirt cheap, is it really a problem to have a separate blog editor, feed reader and Internet browser open at the same time? Surely the added functionality of the more feature-rich individual applications trumps eliminating the need to switch windows, a task that the ctrl+tab (cmd+tab on Macs) keystroke makes negligible. There are purists who insist that an Internet browser is for browsing only, and should not be made to accomplish tasks it was not originally intended for. At present I am inclined to side with those purists (using Safari with no add-ons is a blazingly fast and pleasant browsing experience), though I do hold out hope that Flock, or someone else, will eventually manage to create a browser/blog editor/feed reader that is better than the respective standalone applications without consuming the bulk of a computer’s available memory. Flock is a positive step in what could be “the right direction,” but after two years of development some hoped for a little more solid functionality to go along with the spit-shined exterior.